Confusion reigned on 12 February, as US President Donald Trump released his budget request for the 2019 fiscal year. Just four days earlier, the Congress had lifted mandatory caps on government spending, sending the Trump administration scrambling at the last minute to revise its budget proposal. The White House abandoned its original plan to seek a 27% funding cut for the National Institutes of Health (NIH), a 29% decrease for the National Science Foundation (NSF) and a 22% reduction for the Department of Energy (DOE) Office of Science, holding their funding steady. But the details of Trump’s vision for many agencies remain fuzzy, frustrating science advocates. “The big headline is that at the eleventh hour, [the White House] backed away from their intention of dramatically scaling back on basic research,” says Matt Hourihan, director of the research and development budget and policy programme at the American Association for the Advancement of Science in Washington DC. But science agencies aren’t out of the woods yet, he warns. Even in a budget that seems to support basic science, “they’re still going after programmes, like environmental programmes, that they believe fall outside the purview of government”, Hourihan says. Among other things, the Trump request would cut the US Environmental Protection Agency (EPA) budget to its lowest level since the early 1990s, gut climate-change research at the National Oceanic and Atmospheric Administration (NOAA) and axe five Earth-observing missions and instruments at NASA. 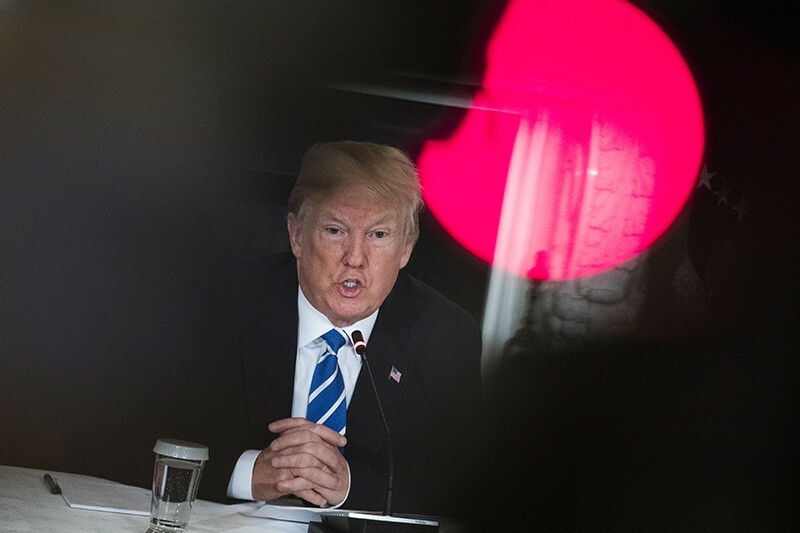 And although biomedical research holds steady under Trump’s final 2019 plan, policy watchers remain sceptical of the president’s intentions. The White House may have reversed course on potential cuts to the NIH and NSF, but Trump still opposes any funding increases for non-military programmes, says Jennifer Zeitzer, director of legislative relations for the Federation of American Societies for Experimental Biology (FASEB) in Bethesda, Maryland. “I think it’d be really generous to read that suddenly NIH and NSF are a priority for this administration,” she says. 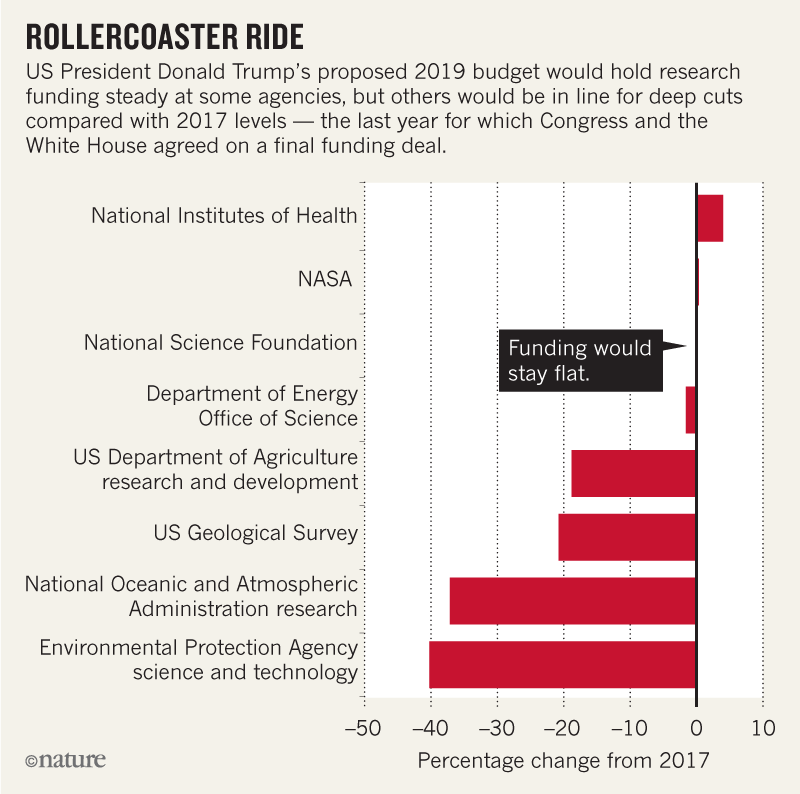 Trump is seeking US$34.8 billion for the NIH — roughly equal to the level in 2017, the last year for which Congress and the White House agreed on a final budget (see ‘Rollercoaster ride’). But the White House wants that money to go further than it does now, by creating three new institutes within the NIH. Among them would be the National Institute for Research on Safety and Quality, which would replace the $324-million Agency for Healthcare Research and Quality within the Department of Health and Human Services. The NSF would also see flat funding under the Trump plan, with a budget of $7.47 billion. That figure includes $2.2 billion that the White House added at the last minute, which it says would support basic scientific research, education programmes, upgrades to research facilities in Antarctica and elsewhere, and cross-disciplinary research activities. But it has not provided a more detailed explanation of how that money would be allocated. Trump’s final proposal for 2019 would boost spending across the NSF’s 7 research directorates by 2%, to $6.151 billion. But it would cut, by 56%, funding for the construction of research platforms — such as the agency’s suite of telescopes — and the acquisition of scientific instrumentation. The budget for that account would drop from $215 million in 2017 to $95 million in 2019. NASA would abandon the International Space Station under the Trump plan, which calls for the space agency to terminate its contribution to the 15-nation facility in 2024, after the current US commitment ends. The administration wants NASA to explore how to turn space-station operations to private industry in 2025, but the plan is unlikely to fly with many members of Congress. The proposed budget would also cancel the Wide-Field Infrared Survey Telescope (WFIRST), which is designed to hunt for exoplanets and dark matter. It has been planned as NASA’s next big astrophysics mission after the James Webb Space Telescope, which is due to launch next year. A recent independent review found that WFIRST’s cost could not be kept beneath the $3.2-billion cap set by NASA (see go.nature.com/2btsw3z), and the agency has been working to revise the mission’s design to reduce its price. US astronomers ranked WFIRST the top large mission in a 2010 survey of science priorities for the next decade. “Cancelling WFIRST is an unqualified disaster for the astronomical community,” says Jon Morse, chief executive of the BoldlyGo Institute in New York City and former head of astrophysics at NASA. If the Congress does not move to continue the mission, “this would be the first time in the history of astrophysics decadal surveys dating back to the 1960s that the highest-priority mission wasn’t accomplished”. Overall, NASA would receive $19.9 billion under the Trump plan, a 1.3% increase from the 2017 level. 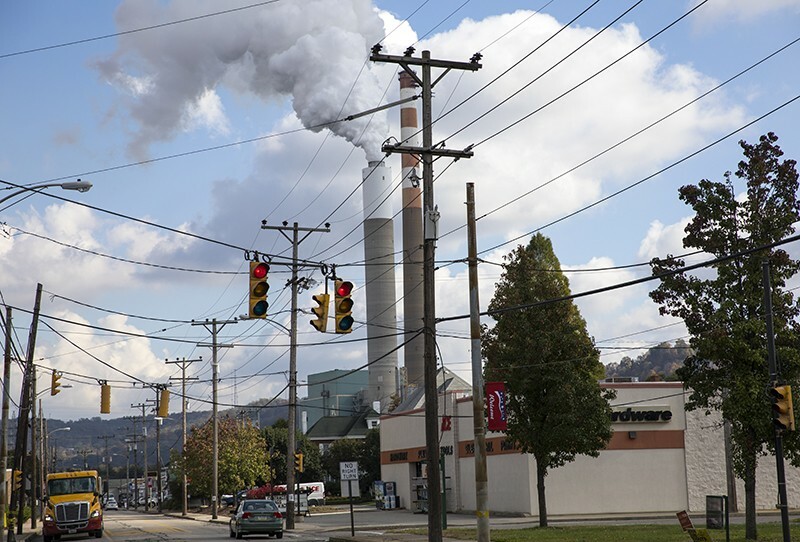 The agency’s science directorate would receive $5.895 billion, a 2.3% increase. Funds for basic research at the DOE’s Office of Science would remain flat, at $5.4 billion. Basic energy sciences would see a nearly 2% increase, to $1.85 billion, but the big winner would be advanced scientific computing, whose budget would rise by nearly 42%, to $899 million. The nuclear-fusion project ITER, under construction in France, would receive $75 million — $25 million above the 2017 level. For the second year in a row, the White House is proposing to kill the Advanced Research Projects Agency—Energy, which supports high-risk energy research. The agency received $306 million in 2017, but the Congress is split over its future. The House’s 2018 funding bill for the DOE would have eliminated the agency, whereas Senate appropriators approved a funding boost, to $330 million. Climate-change programmes would take hits across multiple agencies. The Trump budget would eliminate funding for global-warming research at the EPA, whose overall funds would drop to $6.1 billion, from $8.1 billion in 2017. The plan would eliminate competitive grants for climate-change research at NOAA, and halt research to better understand how global warming is affecting the Arctic. The agency’s overall budget would fall by 20%, to $4.6 billion. It is not clear how Congress will receive the Trump plan. So far, lawmakers have largely rejected the president’s ongoing push for major cuts at federal science agencies. The 9 February budget deal, for example, included a provision to boost NIH spending by $2 billion in 2018 — even though the bulk of the government is operating under a temporary spending plan that expires in late March.